What happened in Flint is a grim reminder that when proper engineering protocol is not followed, the consequences can be as horrific as children being poisoned by lead. In April 2014, the water source for the city of Flint, Mich., was switched. Instead of bringing in drinking water from the city of Detroit, corrosive water from the nearby Flint River was treated at the local plant. The water was then pumped through a 100-year-old distribution system, breaking down pipes in its wake and arriving at people’s taps brown, smelly and unfit to drink. The corroding metal in the pipes caused a host of problems—one of which was that it consumed the residual chlorine in the system. In some pipelines, the chlorine level had decreased to almost nothing, allowing bacterial growth in the crevices inside the pipes. The Flint Utilities Department then responded by increasing the chlorine dosage, but that just caused heightened levels of TTHMs (total trihalomethanes), a carcinogenic contaminant that forms when chlorine combines with organic matter. When high levels of TTHM were discovered, ferric chloride was added to the water to remove the organic matter. Ferric chloride is a coagulant that helped to increase the level of residual chlorine. This may have improved the problem of bacterial growth, but what it also did was make the water even more corrosive, degrading the pipes even further and putting the utility managers back at square one. This downward spiral of poor decisions made the water in Flint unfit to drink or even bathe in. Boiling the water may have protected residents against bacteria, but contaminants such as heavy metals and TTHMs cannot be removed this way. The residents’ only option is bottled water. Residents complained of various symptoms resulting from the water, including rashes, nausea and vomiting, shaking, fever, hair loss, one person even reported that her eyelashes had fallen out after having a shower. Approximately ten deaths from Legionella bacterial infections are linked to the poor water quality. Among the metal contaminants is the neurotoxin lead. The metal is most harmful to children and can permanently damage the brain and nervous system. It is estimated that 8,000 children under the age of six were exposed to dangerous levels of lead. It is easy to view Flint, Mich., as nothing more than a historic blunder, but it is far from that. As the case unfolds and experts learn more about what happened, it becomes increasingly clear that Flint is a really a symptom of the problems facing drinking water systems in the U.S.
Detroit, like Chicago, New York and other major American cities, produces its drinking water at a centralized location and sells it to nearby communities. 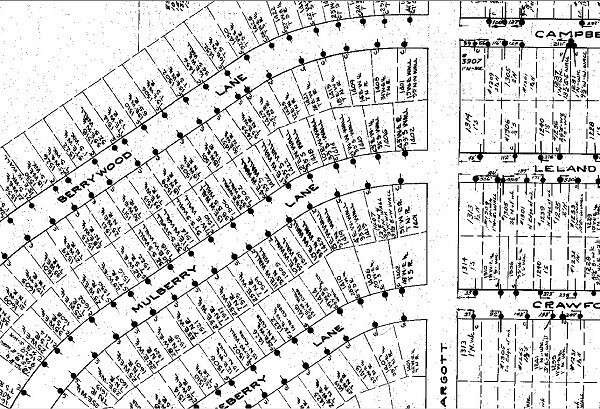 Since 1967, this is how Flint, Mich., a town of 100,000 people, has been getting its water. On Apr. 25, 2014, however, a cost-saving decision was made to switch the water source. Instead of buying water from Detroit, the local water treatment plant in Flint started running full-time. This was a rather large undertaking for the plant, which had been built in 1952 and for years, was hardly used except for backup emergencies. Anurag Mantha is a PhD student who has been collecting water samples in Flint. He has been working in the city alongside Marc Edwards as part of the Flint Water Study Team at Virginia Tech and has studied the Flint water infrastructure. The water treatment plant had seen some recent upgrades. The following turn of events, however, indicate that these upgrades were not enough to handle the still heavily polluted Flint River. Flint, Mich., has been struggling with an ever-dwindling tax base. When the General Motors business declined, the local population fell from 250,000 to around 90,000. 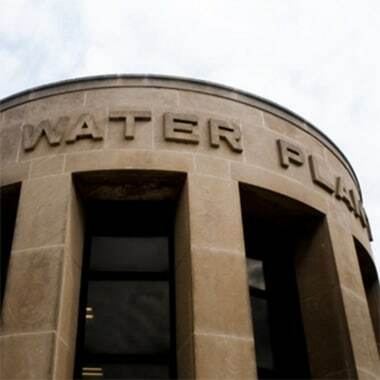 It is shocking that officials saw switching to an old, hardly used water treatment plant as the best way to save money. Other industry experts, however, are less surprised that this happened. The American Water Works Association (AWWA) has been releasing publications since 2001 predicting that funding cuts and old infrastructure will eventually catch up to us. 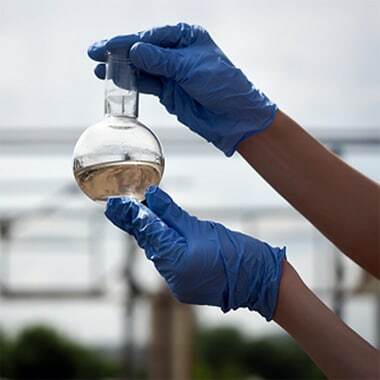 The growing financial needs reflect the challenges currently facing drinking water systems in the U.S. population growth demands that operations expand while new upper limits on contaminants demand more advanced filtration methods. John McCray is a member of Re-inventing the Nation's Urban Water Infrastructure, or ReNUWIT. His role as principal investigator at the Colorado School of Mines involves conducting research for natural water treatment systems. “It’s extremely expensive to do any kind of renovation for treatment plants; they’re not designed to be able to just plug in a new technology,” said McCray. Politicians looking to balance the budget thought they had an answer. Instead, matching an aging water treatment plant to a heavily polluted source with corrosive water, and to a distribution system with 100-year-old pipes, made it a disaster waiting to happen. Residents complained about the taste, color and odor of the water soon after the switch. The problem didn’t emerge on a national scale until Lee Anne Walters, a mom from Flint, found out that her four-year-old son, Gavin, was suffering from lead poisoning. Around December 2014, Flint’s utilities department tested Walters’ tap water and found that the concentration of lead was 104 ppb. She then took her son to the doctor and found out that his blood contained a dangerously high concentration of lead. The EPA action level for lead is 15 ppb, so Walters’ house was seven times above the acceptable limit—and the upper limit for the concentration of lead in tap water is not even considered safe by some. To understand why, we need to talk about the Lead and Copper Rule, which applies to drinking water across the United States. The Lead and Copper Rule is a U.S. federal regulation that was developed by the Environmental Protection Agency (EPA). It provides guidelines as to what method to use for testing lead in the home and what the upper limit is. Mantha states that the Lead and Copper Rule is “not representative of whether or not there are lead problems in the home.” The current EPA requirement is that one liter is collected from the tap after the water has been stagnant for six hours in the home. So if lead is leaching into your drinking water several meters away from your faucet, following the Lead and Copper Rule could mean you won’t detect it. 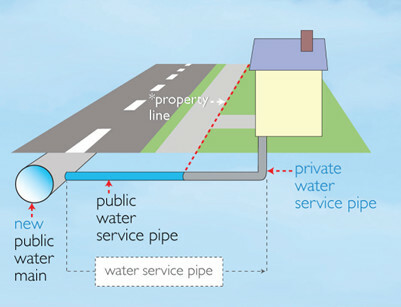 A diagram from the Halifax municipal website shows how replacing the service line within your property boundary does not fully protect you from lead exposure. Lee Anne Walters' house in Flint had just been renovated. She knew that the lead was not coming from pipes within her home. When she didn’t receive much help from the City of Flint as to what to do next, she called the EPA and was put in contact with Marc Edwards from Virginia Tech. Edwards conducted multiple samples on Walters’ house and went above and beyond the Lead and Copper Rule. Instead of collecting water that had been stagnated near the tap, he flushed the water for 25 minutes and then collected samples. What Edwards found was far worse than what was collected by the City of Flint. The above chart shows the results of sampling from Walters’ house on Apr. 28, 2015. 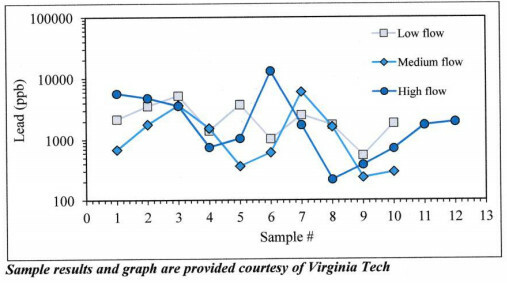 Lead levels were so high that they had to be displayed on a log graph. The concentrations ranged between 200 ppb and 13,200 ppb in the water of Lee Anne Walters’ home. Walters’ house couldn’t possibly be an isolated case. In the second week of August, Virginia Tech sent 300 lead kits around to homes in the city. The EPA and Michigan Department of Environmental Quality (MDEQ) were not responsive to Virginia Tech’s concerns about the lead levels. So Marc Edwards and his students made phone calls to residents in the city. They also held local meetings to spread the word that there are elevated levels of lead in the water and that residents should buy bottled water as soon as possible. For anyone wondering why there lead in the drinking water system, the best answer may be that Flint is an old city. It was built in 1855, when lead was incorporated into many everyday things, especially water mains. That may be true, but lead was used in drinking water systems right up until 1986. It’s widely known that the Romans used lead to construct their pipes, so one can’t help but think of the metal as a thing of the past. Despite everyone knowing its neuro-toxic properties, lead was actually a popular metal in the 20th century. Chicago is another major city where residents are highly concerned about their tap water, because lead was actually required in building plumbing systems until its ban in 1986. “Lead is in soldering of copper pipes. It is combined with brass. There are service lines constructed of lead. Some galvanized iron is coated in lead to protect the iron from corroding,” said Mantha, referring to practices in the mid-20th century. 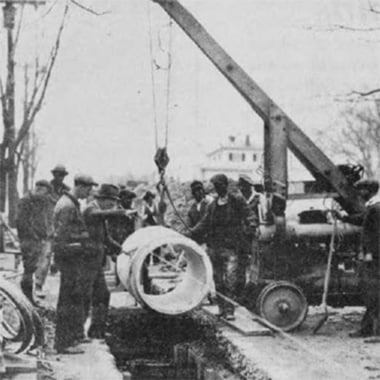 In 1990, when measuring lead levels at the tap had only just begun, the AWWA estimated that the U.S. water infrastructure had about 3.3 million lead service lines and 6.4 million connections made of lead, many of them installed well over 100 years ago. 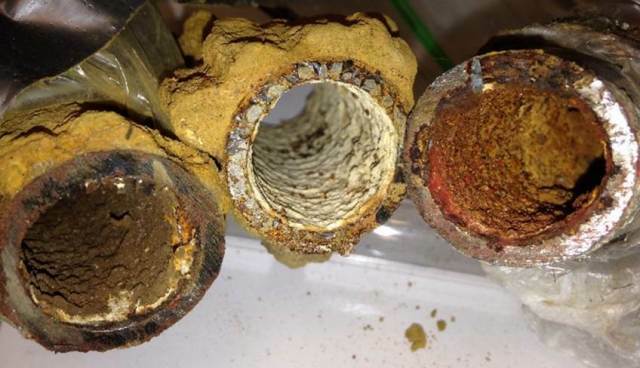 Despite the fact that lead in pipe infrastructure is a real problem, there is one thing that could have been done to prevent this disaster from happening: corrosion control. 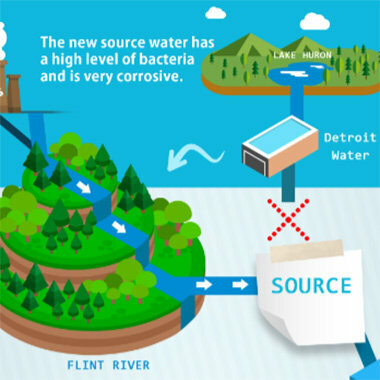 The Flint River water source was highly corrosive from decades of severe pollution, so corrosion control should have been added and in fact is mandated by law for such water sources. Unfortunately, cost came first and the city and the MDEQ neglected to implement it. 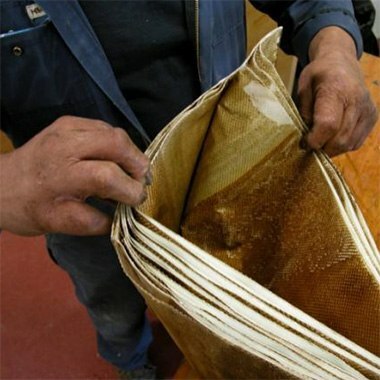 Detroit water had been adding corrosion control for decades and had protected the lead-ridden pipes with a coating all that time. With a simple switch, the coating on the interior of the pipes that had been there for 60 to 70 years had deteriorated in a matter of months. The system has since stabilized, as the non-corrosive Detroit water is now flowing through the system. Reportedly, however, chunks of metal from the interior of the pipes are occasionally breaking off and falling into the drinking water. There are still isolated cases of lead in the tap water and residents still used bottled water for everything. Overall, the situation is better, but not fixed. The best solution, unfortunately, is the most expensive, which is to replace all of the pipe infrastructure. That is simply not an option for Flint. The Department of Environmental Quality announced that the average cost to replace a lead pipe was $4,000, but a recent report from Rowe Professional Services for the State of Michigan announced that it would actually be $7,500 per pipe. The added cost includes construction permits and pavement cuts. 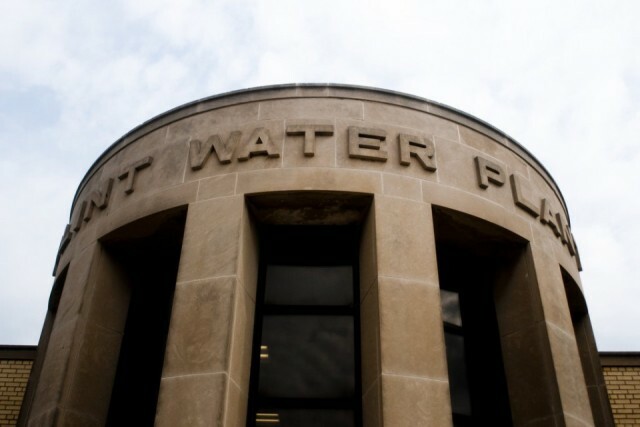 With the system that is currently in place, water leaves the Detroit water treatment system clean and becomes contaminated after traveling through miles of broken and degraded pipes. The water is sometimes a week old when it reaches homes in Flint, according to Mantha. This doesn’t have to be the case. The water distribution system was built when the population was at its peak, at 250,000 people. When the population declined to 90,000, those service lines were left behind. Now, water is travelling through unused water mains throughout the city before it reaches homes. The inexpensive solution for now is to re-engineer the system by cutting off service where it is not needed. This solution may be most helpful to a city like Flint, where there are many unused service lines throughout the city. There are other solutions, however, that are being considered for cities in the U.S. that need to improve old, inefficient water treatment plants and pipelines. Ken Thompson is the deputy director of Intelligent Water Solutions, a program by CH2M Hill. The team’s research involves implementing sensor technology into older water treatment plants and distribution systems using monitoring devices to conduct analyses. The goal is to provide insight into water treatment and system operations to improve their efficiency, security, service and back-end information systems. In one project, CH2M installed sensors into a series of major drinking water pumps. Beforehand, calculating what energy setting to apply to the pumps was done manually by the operator. It depended on the ever-shifting water flow and water level. Once the sensor system was put in place, these calculations could be done constantly. 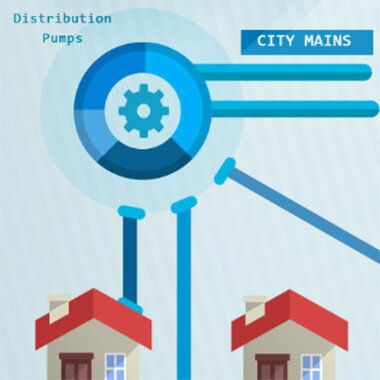 As a result, the pump energy setting could be adjusted more consistently to the changing environment. It is predicted that the system will reduce energy consumption—the largest expense in a water pump station—by 20 to 30 percent. Replacing infrastructure is an expensive option that many cities can’t afford, but for the time being, it may be worth it to install systems similar to what the CH2M team is developing. Thompson discussed how this sensor technology can be beneficial for this type of water quality concern. “[Only running the system at the desired capacity] allows the reservoir to turn over quicker and reduce the potential for any further water quality problems. But that cannot be done unless technology is put in the system and we can understand flows and understand reservoir levels and understand water quality,” said Thompson. For residents who are concerned about lead in tap water, Mantha says there are a few options. There are some utilities in the U.S. that go above and beyond the Lead and Copper Rule, but if you aren’t in the jurisdiction of one of these and you don’t trust your utility, then you can contact a third-party lab. Virginia Tech also collaborates with non-profit organization Healthy Babies Bright Futures, which distributes home test kits where you can sample tap water and send it back to the laboratory. Mantha declares that the outdated Lead and Copper Rule is a “fight that we can take up now.” In the meantime, his team at Virginia Tech continues to work with Flint and raise awareness to other residents about lead in drinking water. The Virginia Tech team is working on figuring out where the optimal places are to cut off service and minimize water travel time. Are there any engineering software programs that are helpful for this type of application? In your experience, are there any issues that the team should look out for, like the possibility of increased pressure for the pipes that will continue to distribute water? 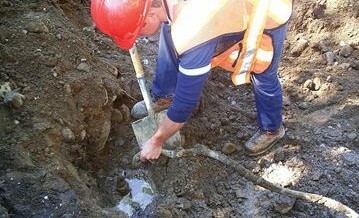 Replacing all of the mains and service lines is an unpleasant and expensive solution – so are there any better options for replacing a 550-mile-long network of pipes in Flint, Michigan? What pipe rehabilitation technologies are the most promising? Are there any types of pipe coatings where implementing them won’t aggravate the lead metals in the joints and fixtures?